Despite the care and attention we take in writing, proof reading and verifying our instructions, mistakes can sometimes happen. Here you will find a list of amendments to enable you to carry on with your knitting project! If you can not find below the pattern book you have, if you think you have spotted a mistake that is not listed here, or if you simply need some advice, please get in touch with our knitting expert at knittingquery@bergeredefrance.com. Row 1 (RS): * slip 1 st and yarn over (= place yarn in front of work, slip 1 st purlwise, and leave yarn in front of work), k1 *, repeat from * to *. Row 1 (RS): k1, * slip 1 st and yarn over (= place yarn in front of work, slip 1 st purlwise, and leave yarn in front of work), k1 *, repeat from * to *. Row 2: k2, p25-27-29, k2. Row 2: k2, p25-27-28, k2. Next row (RS): k2, k2tog, work to last 4 sts, sl 1, k1, psso, k2. Next row (RS - inc): Work to last 4 sts, sl 1, k1, psso, k2. Rep the above inc on every foll 4th row 3 times. Cast off 2 sts at beg of next 2 rows. Next row (RS - dec): Work to last 4 sts, sl 1, k1, psso, k2. Rep the above dec on every foll 4th row 3 times. For all 4 sizes, on the chart: The 2nd 6CR on Row 109 & 115 should be 6CL. On the left edge of chart (end of RS row) the cable twist should start on Row 3 not Row 2. Work 2 rows straight. Next row (RS – central dec): Work to 1 st before the central st, sl 2, k1, pass the knit stitch over the 2 sl sts, work to end. Next row (RS – central dec): Work to 1 st before the central st, sl 2, k1, pass the 2 slipped sts over the knit stitch. Using 3.0 mm needles and col A, pick up 109-111-113-117 sts along front neck edge and along the cast off sts of front contrasting bands. Using 3.0 mm needles and col A, pick up 59-61-63-67 sts along front neck edge and along the cast off sts of front contrasting bands. Some sections of this pattern have entirely been corrected, you can download the full amended pattern from here. Work in 2/2 rib for 7 cm (2 3/4 in) [24 rows], but on the last row work as follows: S - M & XL: decrease 1 st (= 101-109-127 sts). L & XXL: increase 1 st (= 119-139 sts). Work in 2/2 rib for 7 cm (2 3/4 in) [24 rows], but on the last row work as follows: S & M: decrease 1 st (= 101-109 sts). L - XL & XXL: increase 1 st (= 119-127-139 sts). Row 2 & every WS row: k3, p6, k3. Row 2 & every WS row: knit over knit, purl over purl. Place back on needle the 11-12-13-14 sts left on hold on right front. Pick up and knit 10 extra sts on right front neck edge, 22-24-26-28 sts from back neck edge, 10 extra sts on left front neck edge and place back on needle the 11-12-13-14 sts on hold from left front. Work 12-12-14-14 rows in G. st on the 64-68-72- 76 sts obtained. Cast off all sts. Place back on the needle the 11-12-13-14 sts left on hold for right front. Pick up & knit 10 extra sts from right front right neck edge, 10 sts from the right sleeve, 22-24-26-28 sts from the back neck, 10 sts from the front left neck edge, 10 sts from the left sleeve, then the 11-12-13-14 sts on hold from left front. Work 12-12-14-14 rows of G st on the 84-88-92-96 sts obtained. Cast off all sts. When work measures approx. 66 cm (26 in) [171 rows] total, on the WS of work, dec 14 sts in the same way as for Right Sleeve. When work measures approx. 64-65-66-68 cm (25¼-25¾-26-26¾ in) [165-169-171-175 rows] total, on the WS of work, dec 14 sts in the same way as for Right Sleeve. When work measures 42-43-43-44-45 cm ... Next row (RS - dec): work 7 sts in Sideways rib, sl1, k1, psso, p to end. When work measures 42-43-43-44-45 cm ... Next row (RS - dec): work 7 sts in Sideways rib, p2tog, p to end. Using 5.0 mm needles, cast on 39-41-43-45-47 sts. Work even in 2/2 Rib for 7 cm (2¾ in) [20 rows]. Change to 5.5 mm needles, work in Broken rib tbl and inc at each end, 1 st in from edge: S: 1 st 4 times every 14th row, 1 st twice every 12th row. At the same time, decrease on left edge as for front but 4 sts in from edge (work row until 6 sts remain on left hand needle, sl1, k1, pass slipped st over, k4), then cast off on left edge every 2nd row 11-11-13-15 sts once, 3 sts once and the remaining 4 sts. At the same time, decrease on left edge as for front but 4 sts in from edge (work row until 6 sts remain on left hand needle, sl 1, k1, pass slipped st over, k4), then cast off on left edge every 2nd row 11-11-13-15 sts once, 3 sts once, 2 sts once, then the rem 4 sts. On right edge: as for front but 4 sts in from edge (k4, k2 together and work row to end), then cast offon right edge every 2nd row: 11-11-13-15 sts once, 3 sts once. On right edge: as for front but 4 sts in from edge (k4, k2tog, work to end) then cast off on right edge every 2nd row: 11-11-13-15 sts once, 3 sts once, 2 sts once. The shoes are made using 2 strands of the same colour yarn together throughout. Row 31, stitch 36 should be half brown, Row 32 stitch 36 should be brown, Row 43 st 36-42 should be 3CRPK not 6CR. Pattern St, using 7.0 mm needles. Over an odd number of sts. Pattern St, using 7.0 mm needles. Over an even number of sts. Moss St, using 4.0 mm needles. Moss St, using 6.5 mm needles. On the instructions leaflet, sold with the kit. Next row (RS – 1 st dec): k3, k2tog, k to last 5 sts, sl1, k2tog, psso, k3. Next row (RS - 1 st dec): k3, k2tog, work to last 5 sts, sl 1, k1, psso, k3. Using A and 4.5 mm needles, cast on 59 sts. Work even in G. st until piece measures 23 cm (9 in) (70 rows). Using Col A & 4.5 mm needles cast on 59 sts. Work even in G. st until piece measures 47 cm (18 1/2 in) [142 rows]. Using 3.5 mm needles and 1 strand of col B, cast on 15 sts. Work even in G-st for 10 cm (4 in) [43 rows]. Using 3.5 mm needles and 1 strand of col B, cast on 6 sts. Work even in G. st for 5 cm (2 in) [21 rows]. Using 3.5 mm needles and 1 strand of col B, cast on 7 sts. Work even in G-st for 5 cm (2 in) [22 rows]. Using 3.5 mm needles and 1 strand of col B, cast on 3 sts. Work even in G. st for 2 cm (3/4 in) [8 rows]. 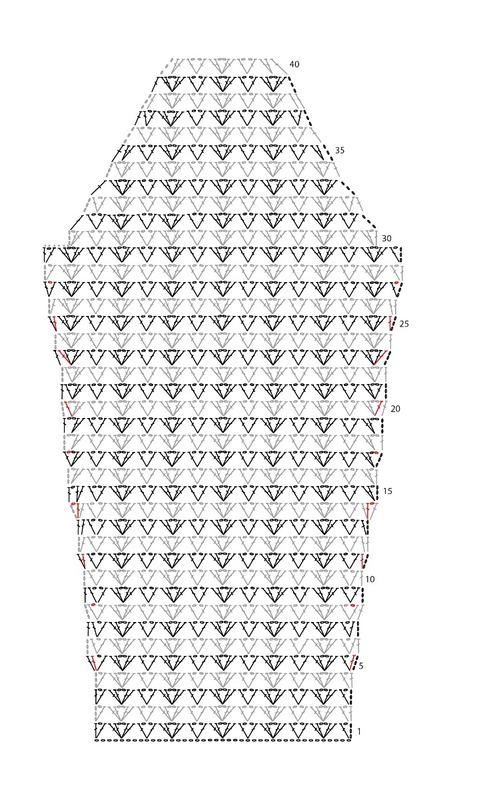 Cont on the 45-49-53-57 sts obtained until work measures 17-19-22-23 cm (6¾-7½-8¾-9 in) [40-46-52-54 rows] total. Cont on the 47-51-55-59 sts obtained until work measures 14-16-18-19 cm (5 1/2-6 1/4-7-7 1/2 in) [40-46-52-54 rows] total. LACE ST, (...) Row 1 (R.S. ): yon, k2tog, *k4, yon, k2tog* rep from *to*. LACE ST, (...) Row 1 (R.S. ): yon, k2tog, *k4, yon, k2tog* rep from *to* ending with k2. Next row (R.S. inc): k2, k2tog, work to end. Next row (R.S. inc): k2, inc 1, work to end.	.
With WS facing pick up sts left on stitch holder. Work 1 row straight. Neck: Next row (RS – neck dec): Work to last 4 sts, sl 1, k1, psso, k2. Rep this dec on every foll 4th row10-12-15-16-18 times, then on every foll 6th row 5-4-3-3-2 times. When work measures 41-42-42-43-44?cm (16-16½-16½17-17¼ in) [130-134-134-136-140 rows] total. Cast off at the beg of every RS row as foll: 0-0-0-4-4 sts 0-0-0-1-1 time, 3 sts 1-1-1-1-2 times, 2 sts 2-2-3-3-3 times. Next row (RS – dec): k2, k2tog, work to end. Rep this dec on every foll RS row 5-6-5-5-5 times. Cont on the rem 25-27-29-30-32 sts until work measures 60-62-64-66-68?cm (23½-24½-25¼-26-26¾ in) [190-196-202-208-214 rows] total. Cast off at the beg of every RS row as foll: 6-6-7-7-8 sts 3-1-3-2-4 times, then 7-7-8-8-0 sts 1-3-1-2-0 times. Work the WS of pattern stitch as folls: p3, work in pattern stitch until there are 3 sts rem on the LH needle, p3. After each RS raglan dec work the next WS row as foll: p3, work in Pattern Stitch until 3 sts rem, p3. Using 3.5 mm needles cont in Pattern st foll the Chart according to the size you are working. Using 3.5 mm needles cont in Pattern St starting as for left front. Using 3.5 mm needles cont in Pattern st starting at the 15th-14th-12th-11th st on the Chart. Using 3.5 mm needles cont in Pattern st starting at the 13th-12th-10th-9th st on the Chart. Row 1 (RS): sl 1, *k1, p1* rep from *to* 13 more times, k 26-27-29-30-32 . Row 2: k 27-28-30-31-33 , *p1, k1d* rep from *to* 12 more times, p1, k1. Row 1 (RS): sl 1, *k1, p1* rep from *to* 13 (14-15-16-18) more times. Row 2: k 27-28-30-31-33 , *p1, k1d* rep from *to* 12 (13-14-15-17) more times. Row 2: sl 1, *p1, k1d* rep from *to* 13 more times, knit to end. Row 2: sl 1, *p1, k1d* rep from *to* 13 (14-15-16-18) more times. Cast off at the beg of every WS row as foll: 13-14-16-17-20 sts once, 3 sts twice, 2 sts twice, 1 st twice. *Work 3 rows straight, then cast off 1 st at beg of next WS row* rep from *to* once. Cont on the rem 20-22-24-26-28 sts until work measures 66-68-70-72-74 cm (26-26¾-27½-28½-29 in) [186-190-196-202-208 rows] total. Row 2: p3, *k2, p3* rep from *to* until 5 sts rem, k2, p3. Row 2: p3, *k2, p2* rep from *to* until 5 sts rem, k2, p3. 5CL over 2 k sts: Slip 3 sts to CN in front of work, k the next 2 sts, then k the 5 sts from CN. 5CL over 2 k sts: Slip 5 sts onto CN in front of work, k the next 2 sts, then k the 5 sts from CN. Cont and work straight in G.st for 4 cm (1½ in) [12 rows]. Next row, decrease 10 sts evenly spaced. Cont & work in G St for 4 cm (1½ in) [12 rows]. Next row: Increase 10 sts evenly spaced. Work straight in St st until piece measures 3 cm (1¼ in) [20 rows]. Work straight in St st until piece measures 2 cm (¾ in) [10 rows]. Work straight in St st for 4 cm (5½ in) [4 rows] and cast off all sts. Work straight in St st for 4 cm (1½ in) [20 rows] and cast off all sts. Continue on the remaining 23-27-31-35 sts until work measures 30-36-40-44 cm (11¾-14¼-15¾-17¼ in) (102-112-126-140 rows) in total. After armholes continue on the remaining 23-27-31-35 sts until work measures 30-33-37-41 cm (12-13-14½-16¼ in) (102-112-126-140 rows) in total. Take measurements with work vertical from the cast on edge. Work 1 row on the rem 22-24-26 sts. Next row (RS): k1, *k2tog, k1* rep from *to*. Work 1 row on the rem 12-13-14 sts. Work 1 row on the rem 22-24-26 sts. Next row (RS): k2, then k2tog across row. Work 1 row on the rem 12-13-14 sts. Using Col A cast on 44-50-54-60-66 sts, then cast on 4 sts using Col B. Cast on 4 sts using Col B, then 44-50-54-60-66 sts using Col A. Using Col B cast on 4 sts, then cast on 44-50-54-60-66 sts using Col A. Cast on 44-50-54-60-66 sts using Col A, then 4 sts using Col B.
Cont on the rem 96-102-110-118-126 sts until work measures 12-12-13-14-15 cm (4¾-4¾-5-5½-6 in) [66-66-72-76-82 rows] total. Then cast off at the beg of every row as foll: 2 sts 10 times, 3 sts 12 times & the rem 40-46-54-62-70 sts.